Dominique's essential contributions to magnetism are left for future generations. All of the people who had the honor of knowing him will always remember him with respect and affection, as a great scientist and an excellent person. Dominique will be remembered by the ICMAB community for his immense scientific and formative work, but especially for his closeness, humanity, cheerfulness and for having always extended a helping hand. Dominique Givord studied engineering at the Polytechnic Institute of Grenoble and received his PhD from the Joseph Fourier University. After a postdoctoral stay at the Oak Ridge National Laboratory (USA) he returned to Grenoble where he was a professor at the Polytechnic Institute, to later join the National Center for Scientific Research (CNRS), first in the Electrostatics and Metal Physics Laboratory, where he worked with Rémy Lemaire, and then in the Laboratory of Magnetism Louis Néel and in the Laboratory of Pulsed Magnetic Fields of Toulouse. After the discovery of Nd2Fe14B in Japan and the USA in 1983, he co-directed the academic-industrial consortium of the Concerted European Action on Magnets (CEAM). Throughout his career he made essential contributions to the study of rare earth transition alloys, the sintering of Sm-Co and Nd-Fe-B magnets, the magnetostriction in rare earth-iron crystals, the magnetic coercivity and viscosity, the exchange coupling to improve the thermal stability of nanoparticles, the electric field effects in thin ferromagnetic films and in spintronics. 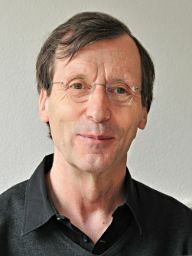 Dominique was Research Director of the CNRS from 1986 to 2009. He managed the Louis Néel Laboratory in Grenoble between 1992 and 2000 and the National Laboratory of Pulsed Magnetic Fields in Toulouse from 2000 to 2002. Among other positions of responsibility, he was Editor of the Journal of Magnetism and Magnetic Materials between 2003 and 2014. In 2000 he received the Great Medal of the French Society of Metallurgy and Materials. In 2007 he was awarded the first Louis Neel Grand Prize in Physics and Applications. Figure: Spintronics. Network of magnetic structures in a vortex. C. Pfeiderer/TUM.